Deik 2 In 1 Cordless Vacuum Cleaner Just $79.20! Down From $299! PLUS FREE Shipping! You are here: Home / Great Deals / Amazon Deals / Deik 2 In 1 Cordless Vacuum Cleaner Just $79.20! Down From $299! PLUS FREE Shipping! Head over to Amazon where you can score Deik 2 In 1 Cordless Vacuum Cleaner for just $79.20 down from $299 PLUS FREE shipping! When storage is limited, you may find yourself at a loss as to what vacuum would fit in your home. But fret no more with the Cordless 2-in-1 Folding Vacuum Cleaner from Deik! Designed to be bagless, cordless and including an innovative folding handle, this vacuum is ideal for small households, flats or anyone looking for a powerful, but lightweight device. 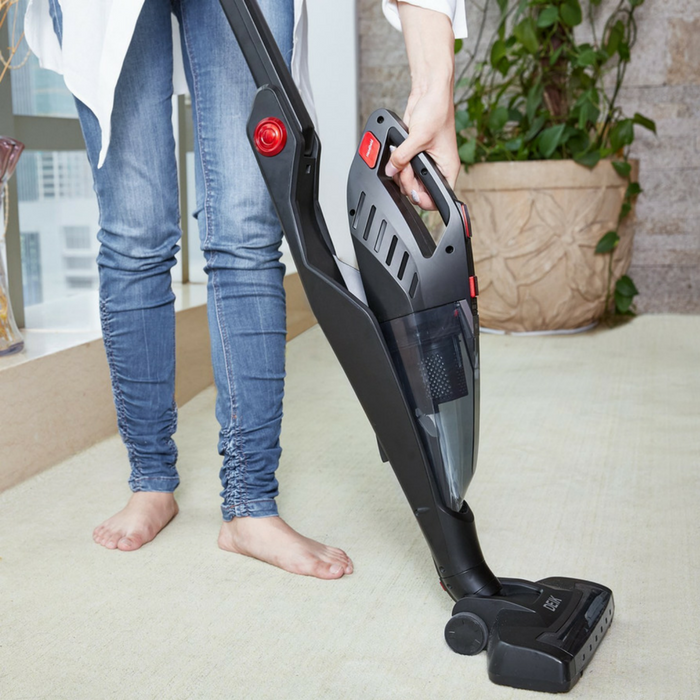 Incredibly versatile, this vacuum cleaner is perfect for sweeping up dirt and debris from your floors, then you can clear away all the dust and crumbs from furniture, shelves and stairs with the handheld device. Lightweight & Flexible: Weighing only 2.32kg, this vacuum cleaner still provides an impressive 7Kpa of power – providing a deep, thorough clean without compromising on the maneuverability.180 Swivel Steering System for effortless maneuverability around the home. Run Time: 2200mAh battery with up to 30 minutes of uninterrupted cleaning – from just one charge. Battery indicating LED Light. It looks that way, but you’d have to ask the manufacturer. You can click through the link and there is a comment section at the bottom where you can ask and the manufacturer or other buyers can tell you for sure.